Women artisans in Nepal do the intricate, multi-colored bead work on these eye-catching bangles by hand. These irresistible pieces of arm candy are handmade by women artisans in Nepal. They string beads into patterns one at a time, then crochet them into multi-colored bangles. Their intricate beadwork combines classic and modern influences, adding eye-catching shimmer and shine to both casual and dress-up outfits. 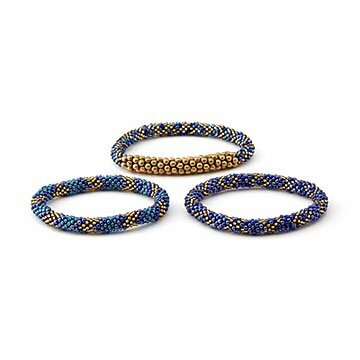 Made of the highest quality Czech and Japanese glass seed beads, they roll right onto the wrist. Set of 3. Choose Bluejay or Serengeti Multi. Designed in the US. Handmade in Nepal. Note: If yours is tight at first, worry not: it will quickly stretch to fit your wrist.